Pygmalion (1912) was Shaw's best known play, about Henry Higgins' experiment as a professor of phonetics teaching cockney English girl, Eliza Doolittle to speak like an aristocratic lady. 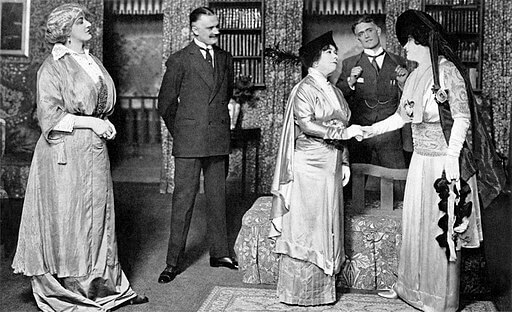 [Photo on the right is of the 1914 production.] 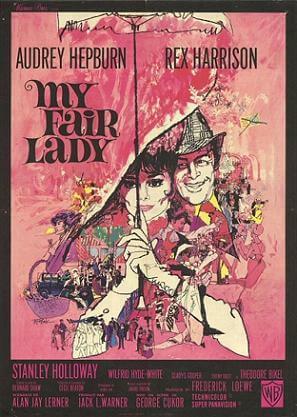 The popular play was adapted into a popular American movie musical, My Fair Lady in 1964, starring Audrey Hepburn and Rex Harrison . Who can forget her break-through recitation of, "The rain in Spain falls mainly on the plain" and Julie Andrews singing "I could have danced all night" in the 1954 production. The play's title comes from ancient Greek mythology, in which Pygmalion fell in love with one of his sculptures, which then came to life. So too, does Henry Higgins with his "creation." Return to the Bernard Shaw library.